Not to be confused with Aristotelia serrata, a New Zealand tree also called wineberry. Rubus phoenicolasius (Japanese Wineberry, wine raspberry, wineberry or dewberry) is an Asian species of raspberry (Rubus subgenus Idaeobatus) in the rose family, native to China, Japan, and Korea. The species was introduced to Europe and North America as an ornamental plant and for its potential in breeding hybrid raspberries. It has subsequently escaped from cultivation and become naturalised in parts of Europe and North America. The species is a perennial plant which bears biennial stems ("canes") from the perennial root system. In its first year, a new stem ("primocane") grows vigorously to its full height of 1–3 m, unbranched, and bearing large pinnate leaves with three or five leaflets; normally it does not produce any flowers the first year. In its second year, the stem ("floricane") does not grow taller, but produces several side shoots, which bear smaller leaves always with three leaflets; the leaves are white underneath. The flowers are produced in late spring on short, very bristly racemes on the tips of these side shoots, each flower 6–10 mm diameter with five purplish red to pink petals and a bristly calyx. The fruit is orange or red, about 1 cm diameter, edible, produced in summer or early autumn; in botanical terminology, it is not a berry at all, but an aggregate fruit of numerous drupelets around a central core. Ripening occurs from early summer. The canes have red glandular hairs. These red hairs give the species its scientific name, from the Latin phoenicus, meaning red. In addition to seed propagation, new plants are formed from the tips of existing canes touching the ground. They enjoy moist soil and grow near and within wooded areas. As a fruit develops, it is surrounded by a protective calyx covered in hairs that exude tiny drops of sticky fluid. While the structure resembles those of carnivorous plants, the wineberry plant does not get nutrients from insects caught in the sap: the sticky mucilage contains no digestive enzymes, surrounding tissues cannot absorb nutrients, and there are no protein-storage tissues. Also, unlike carnivorous plants, wineberry grows in nutrient-rich soil, so it need not resort to insect proteins as a source of nitrogen. The plant's leaves and stems/branches are covered in spines. The leaves appear in sets of three, where the two side leaves are small, and the center leaf is large. The leaves are green on top, and white on the bottom because of a dense layer of woolly hairs. Wineberries grow in the wild in many parts of the United States, primarily the Appalachian Mountains. They are common along the edges of fields and roadsides, and still are used as breeding stock for raspberry cultivars. They are one of the most easily identified invasive edible plants, with no poisonous look-a-likes in North America. Other plants that may be mistaken as wineberries include red raspberry, black raspberry, and blackberry, all of which are edible. Sweet and tart with a raspberry-like flavor, wineberries are used in food similarly as for raspberries, such as pie or other sweet treats. The wineberry is native to eastern Asia and has been introduced into parts of North America and Europe. Wineberries grow vigorously and can form extensive, dense thickets that displace many native species. Wineberries can be found in many habitats, such as forest, fields, stream banks, and wetland edges, as well as open woods. The first years of growth for wineberries are longer (approximately 32%) than many other black and red raspberries. Wineberries are a host to several viruses, such as raspberry yellow spot that can affect native species of raspberry. Wineberry vine growth may be controlled variously, such as by biological mechanisms increasing susceptibility to diseases, or mechanical effects by digging, excavating or repeatedly cutting back the plant until it dies. Chemical control via the use of a systemic herbicide, such as glyphosate. Concentrations mixed to the manufacturers specifications can be applied to the leaves to kill the plants. The wineberry is listed as a noxious weed by both Connecticut and Massachusetts where its possession and sale are prohibited by law. ^ Rubus phoenicolasius was first described and published in Bulletin de l'Academie Imperiale des Sciences de St-Petersbourg 17(2): 160–161. 1872 "Name – Rubus phoenicolasius Maxim". Tropicos. Saint Louis, Missouri: Missouri Botanical Garden. Retrieved July 27, 2011. ^ "Rubus phoenicolasius". Natural Resources Conservation Service PLANTS Database. USDA. Retrieved 25 October 2015. ^ Swearingen, J.; Reshetiloff, K.; Slattery, B. & Zwicker, S. (2002). "Wineberry". Plant Invaders of Mid-Atlantic Natural Areas. National Park Service and U.S. Fish & Wildlife Service. 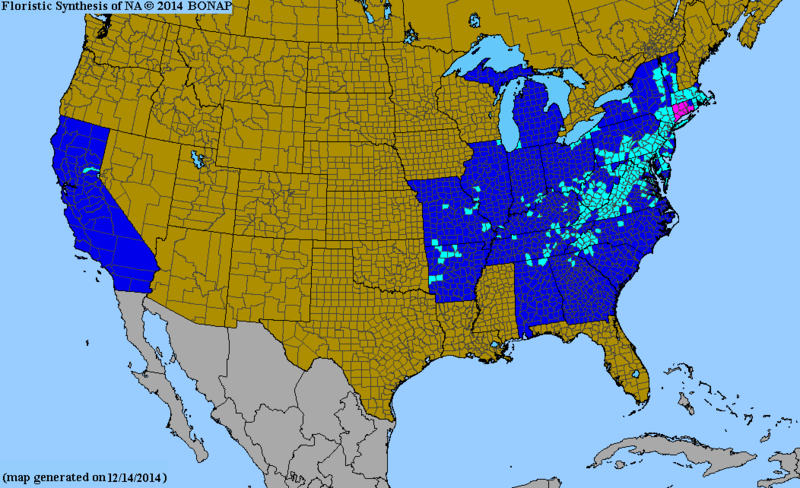 ^ "Biota of North America 2014 county distribution map". ^ a b cbargero@arches.uga.edu, Charles T. Bargeron,. "Plant Invaders of Mid-Atlantic Natural Areas". www.invasive.org. Retrieved 2018-06-06. ^ a b c d "Rubus phoenicolasius". www.fs.fed.us. Retrieved 2018-06-06. ^ a b "Wineberry". National Park Service www.nps.gov. Retrieved 15 Jan 2015. ^ "Wineberries" (PDF). Plant Conservation Alliances, Alien Plant Working Group. 20 May 2005. Retrieved 6 June 2018. ^ "Plants Profile for Rubus phoenicolasius (wine raspberry)". plants.sc.egov.usda.gov. Retrieved 2018-06-06. Wikimedia Commons has media related to Rubus phoenicolasius.